Herbst® Appliance/Jones Jig Applian: Used to correct overbites, this fixed orthodontic appliance is typically used on younger patients. Palatal Expander: Designed to widen your upper jaw, a palatal expander applies outward pressure on your upper molars to expand your palate. Elastics (Rubber Bands): Rubber bands are used with fixed metal or clear braces. They must be worn at all times and changed three times per day per our instructions. Headgear: For a severe overbite or underbite, headgear or a facemask is sometimes used to continuously pull on your jaw, changing your growth. Wear 12 to 14 hours per day. TADs: Temporary anchorage devices provide a fixed point from which to apply force to move teeth. 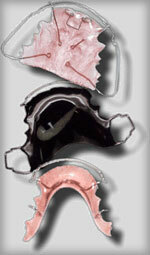 As with retainers, all orthodontic appliances should be worn as prescribed. They should be cleaned with toothpaste twice a day, and if removed for eating or sports, they should be placed in their container, never in a pocket or napkin where they may be broken or thrown away.